Campaign background: The Student Worker Alliance (SWA) at Washington U - St. Louis formed in November 2003 after 36 Nicaraguan campus workers were dismissed and forced to return to Nicaragua the following week. SWA is "dedicated to fostering relationships between students, the subcontracted employees of Washington University, and the community." 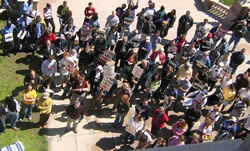 From its beginning, SWA's goal was "to begin a living wage campaign at WU." For two years, SWA pressured Chancellor Mark Wrighton to adopt their proposed Code of Conduct. But Chancellor Wrighton wasn't listening. Finally, during the spring semester of 2005, members of the SWA staged a sit-in in their admissions office, and eventually escalated further to a hunger strike, in solidarity with campus workers. The SWA won an agreement from the administration to dedicate $1,000,000 towards raises in workers' wages, among other significant steps forward. However, just as in the campaign at Georgetown U, the administration refused to agree to card check neutrality.